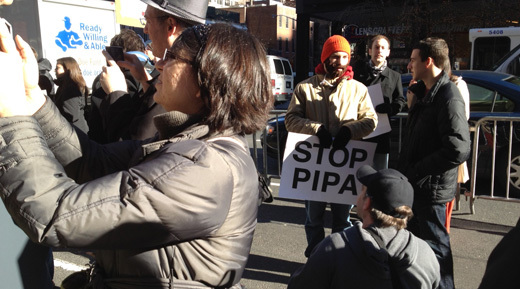 At an emergency New York Tech Meetup held outside the offices of Senator Schumer & Senator Gillibrand, hundreds of geeks, founders, designers, programmers and other rational people gathered in protest against SOPA and PIPA. TNW was there and live blogged the entire event. You can check it out here to see exactly what happened. Reddit Co-founder, Alexis Ohanian spoke at the event and stayed afterwards to talk about the controversy. Check out the video below to see the interview. To learn more about Ohanian, take a peak at how the internet will be made not managed. Today, the NY Tech Meetup called an emergency meeting of its 20,000 members today, at the offices of New York Senators Schumer and Gillibrand. We’re here to discuss SOPA, PIPA and the potential threats that they are to the United States’ thriving technology culture.